It’s very satisfying to promote science and education and see good results. Setting a good example for young people, being a role model, is very important for me. We need to become good citizens in the global village, instead of competing. What are we competing for – to drive more cars, eat more steaks? That will destroy the world. Yuan Tseh Lee is a Taiwanese-American chemist. 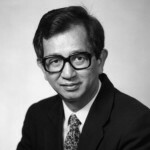 He was the first Taiwanese Nobel Prize laureate, who, along with the Hungarian-Canadian John C. Polanyi and American Dudley R. Herschbach won the Nobel Prize in Chemistry in 1986 "for their contributions to the dynamics of chemical elementary processes".